Give me an accurate reference from one of your jobs and I could tell you about your work history. Show me a glimpse of a corner of your room and I can describe your house and your desk at work. Show me a moment where you’re being honest and true and I can describe the way you live your life. Why? 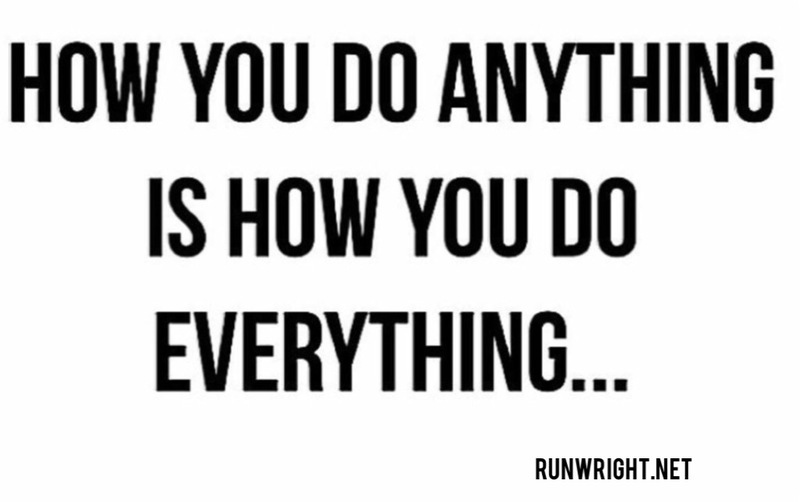 Because how you do anything is how you do everything. Who we are is a constant. A person who smiles in the morning is a person who has a pleasant persona. A person who’s positive when things are going well is a person who’s positive about life. (The pessimist isn’t positive even when things are going well; instead, they’re the ones interrupting the celebration to tell you that good times and the other shoe is going to drop very soon) A person who’s conscientious and helpful even though they are busy, is a person who will help you anytime. In his book, Blink: The Power of Thinking Without Thinking , Malcolm Gladwell talks about how much information we can get from a short association with a person. One of the theories he posits is that if you want to know how a person will perform at a job, their soft skills, you can take a look around their bedroom. The messy person who has used tissue piled up on their nightstand and clothes and books strewn across the room, will have a messy desk at work, will have problems meeting deadlines because they are disorganized in general, and they hand in sloppy work because they generally don’t care about appearances. One of the greatest gifts we possess is intuition – we can tell a lot about a situation after limited exposure to it. We don’t need lots of time, we don’t need to ask 20 complicated questions. In fact, quite the opposite is true. Sometimes, the more information we acquire, the less we rely on our own intuition and we start making unwise decisions. We can tell a lot about people in how they present themselves initially – the first impression. But have you thought about what you’re presenting to others? What would people think about you by watching you work for a moment? Would a prospective employer hire you if they came to your house instead of interviewed you in their office? If how you do anything is how you do everything, what message are you sending by how you’re doing whatever it is that you’re doing right now? This was really inspirational! I always think that we need to be who we want to be! I like that sentence a lot! Thanks for sharing it. Hmm, this certainly makes me think! I feel like I can be all over the place sometimes but generally I’m a neat person because I HATE clutter and always try to do my best work possible! This refers to the attitude more than the outcome. Sometimes we are all over the place because we overestimate how much we can accomplish but generally if you do good work even when you’re stressed, it’s likely that you have a good work ethic even in low-pressure situations. Thanks, Paul! Are you saying that you agree with me?